This is the Olight PL-Mini Valkyrie weapon light , sent to me for review from Olight and NO other compensation other than keeping the light. The PL-Mini can be found at the following links (NON affiliated)……. 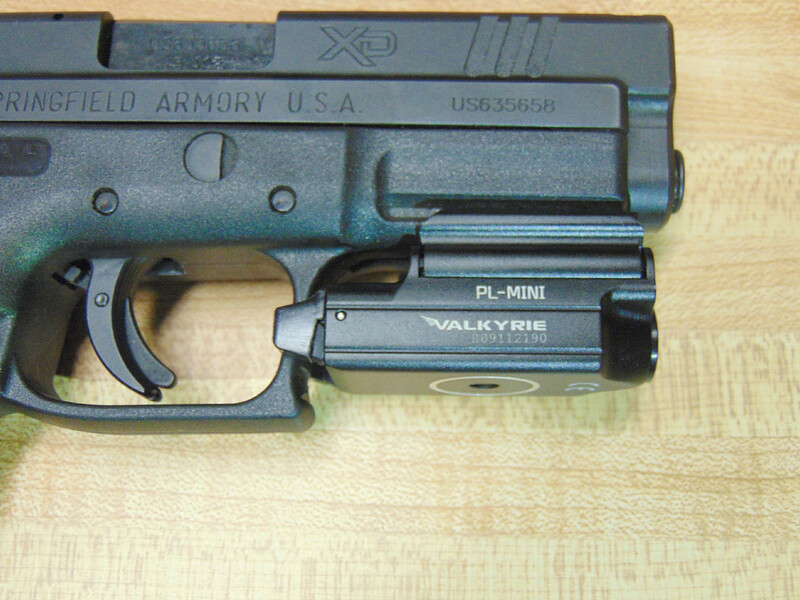 The PL-Mini is a very compact and very robust little weapon light that can be mounted on the stock Glock rails or ANY Picatinny rail mount , whether on a pistol , rifle , or shotgun. The package includes the Light itself , the magnetic charger , the adapter for the Picatinny rails (comes with Glock rail mount on it) and the tool for changing to that adapter. Being a weapon light the PL- Mini size is very small and the UI was kept very simple , with a single mode for constant on , or a single “tactical” mode and the light is made to be ambidextrous. 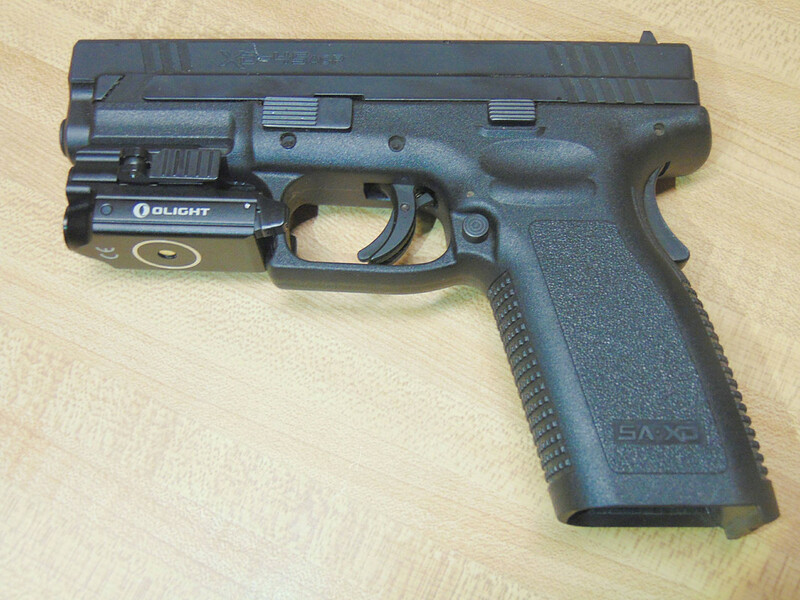 The constant on is activated with a quick press of either of the switches that are located at the very rear of the light and in position for an easy touch when mounted on a pistol. To turn the light off from the constant on mode another quick press is all that is needed. The tactical , or momentary on , is done with a press and hold of either switch and goes off when released , no matter if only held for a couple of seconds or for a long period , as long as the switch is fully depressed and held , the light stays on and then goes off when the switch is released. The PL-Mini uilizes the XP-L HI emitter with 400 lumens and a fairly wide , but yet also fairly defined hotspot , the PL-Mini has a good coverage for indoor and Tactical type use. The beam indoors is plenty to light up most any room and with the momentary on function the light becomes very tactially friendly , as you can use it quickly , let go of the switch for the light to go off and then reposition if needed. The PL-Mini will also go pretty much unnoticed as far as feeling any extra weight on your weapon , as it is a very lightweight at only 62 grams total. The PL-Mini would also be suited for outdoor use for shorter distances of probably 40 yards or less , which if using a pistol , is more than enough distance to see. With the quick release cam lock lever on the light , it makes changing out the light , or moving it to a different weapon very easy and only takes seconds to do. You simply pull outward on the lever to unlock the light , move it to the next weapon and then push the locking lever back down to lock it onto your weapon of choice. I also dropped this light onto the (simulated) wood floors in my house from shoulder height (I am 5’9”) 10 times in a row , just to see how it handled the shock of hitting and bouncing from that height. The light is still working as it should and I couldnt even find a mark on the anodizing , so I would say just from that test the PL-Mini will stand up to at least SOME rough treatment. Overall I am very pleased with this little light. I think Olight has come up with a very nice , compact and very functional weapons light that will serve its purpose well. 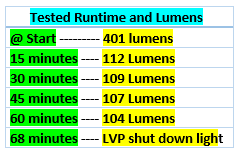 Run Times and lumens Testing….. I forgot to add the pictures of the PL-Mini installed on the pistol in the video portion so here those are……..
For those who do not want to watch the whole video the still pictures and beamshots start at 6:03 of the timeline and the outside live footage starts at 8:43 of the video timeline. Thanks for the review. I like the size and price. Are you planning to take it apart, so we can figure out how hard it is to replace the “non-replaceable” battery? Glad to do the reviews. As far as taking the light apart I already tried and after taking out what screws that would come out and trying to pry in a couple of spots the light seems to be glued or very solidly put together. I probably wont go any further for now as I really like this little light and would like to see at least some use out of it before I do completely break it. Pretty sure you would have to find an exact fit for the cell IF you were to get the light apart though , because there can’t be any room to spare inside that tiny housing I don’t think for a cell that didn’t measure exact. Understandable. Unfortunate, because I hate user-inaccessible proprietary batteries, but I would be hesitant to go any further than you did. It seems like those tiny little pins that are dang near unseen are holding some of it together and the rest of the light is either glued or pressed together very well. Well maybe after this one sees a little usage I will get nasty with it and make it come apart one way or another. For now I think the little light will live a peaceful life for at least a little while though. I have been looking for something smaller than the Streamlight TL-1 HL This looks like it might be a good choice. I need one half that size to mount on my Glock 29. Thank you for the review. Glad to do the reviews guys………. I am not aware of any out there that are smaller than the PL-Mini right now ……especially that might have close to the 400 lumens and the run time. I have been wrong before though.